There has been a complete change with the way VMware is licensing vSphere 5.0, and there are many blogs out that discuss the changes (good and bad). I think a very good opportunity for smaller companies has been overlooked or not talked about much. This VMware PDF outlines the different licensing options for vSphere 5, and here is a previous Journey to the Cloud post discussing licensing and pricing changes. The change that I am talking about is the discontinuation of VMware Advanced Edition. What?? Why would this be a good opportunity for small to medium businesses? Well, VMware is being generous and taking all the customers on the Advanced and Advanced Acceleration Kits and moving them to Enterprise. That means that if you have those editions or buy them before 4.1 is not sold anymore, then you get an automatic upgrade to Enterprise for much less that it would take to purchase it. Nice!! Let me back up a second and talk about the different editions of VMware because this can be confusing unless you deal with it all the time. There are basically 3 different “levels” of VMware. It is important to remember that the software between these levels is exactly the same; certain features have been disabled for each level, but the code and functionality is the same. First are the Essentials, Essentials Plus, and Remote and Branch Office editions. These are perfect for small to medium businesses that are just getting into VMware. They come with 6 sockets of vSphere and vCenter Server for Essentials. This provides everything needed to get started in virtualization including vMotion and High Availability (with Essentials Plus). The limiting factor for these editions is the 6 socket/3 host maximum. You cannot manage more than 3 hosts with vCenter Server for Essentials so when you need to go to 4 or more hosts, you need to buy an upgrade edition called an Acceleration Kit. In vSphere 4.x there were 2 Acceleration Kits, Advanced and Midsized. Purchasing these would give you 6 sockets of vSphere and the Standard vCenter server (1 location only), which can manage as many hosts as you have. You would then buy CPU licenses for any additional hosts that you have. The huge opportunity now is if you have, or buy, an Advanced or midsized Acceleration kit before VMware goes to a vSphere 5.0 only model, you can essentially buy the advanced version and get the Enterprise version when you decide to go to vSphere 5. More features at a much reduced price equals value to me! One more important change in the Acceleration kits with vSphere 5.0: when you buy an acceleration kit, they revert to the Standard, Enterprise or Enterprise Plus licenses as soon as you activate them. With vSphere 4.x, you had to buy additional acceleration kits when you added more hosts; with 5.0 all you do is buy more of the regular license. This is a much better way to manage this going forward for VMware and their customers. 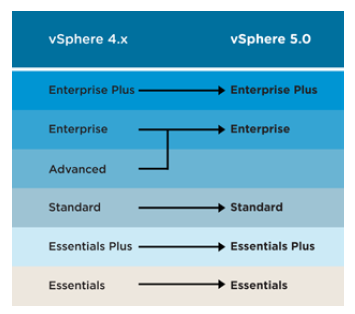 The other editions for vSphere 5.0 are Standard, Enterprise and Enterprise Plus. vSphere 4.0 has an advanced version but that is no longer available when you upgrade to 5.0. Same deal here: if you have Advanced Edition now on vSphere 4.x, then you are the proud owner of vSphere Enterprise when you upgrade, and can take advantage of all the new features. Here are the links to the features of each version. vSphere for small and medium businesses and vSphere for Enterprise. Here is a guide from VMware with a bunch of information about the benefits and how to upgrade your licenses. This is a great time to upgrade your VMware licenses if you need to anyway and want to take advantage of this offer and get access to some additional features. Jan 17, 2018 In "Journey to the Cloud", "CPU", "SMB", "vSphere 5"
Sep 13, 2017 In "Journey to the Cloud", "CPU", "SMB", "vSphere 5"
Nov 19, 2014 In "Journey to the Cloud", "CPU", "SMB", "vSphere 5"